Natalie, Lauren and Ashley's Blog: First Update - We're 34 weeks! First Update - We're 34 weeks! This is our first blog! Living in Hong Kong (5 years now!) and with our first baby (Natalie) on the way, we wanted a way to share our experiences with family and friends from overseas. This is it :) Check back for updates! 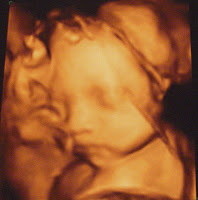 We are now 34 weeks pregnant (with baby due June 12, 2007) and super excited about her arrival. 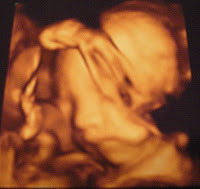 We have definitely confirmed she is a girl (via 3D/4D scans) and she currently weighs a healthy 5 lbs (in utero). Above are her "photos" taken from 26 weeks.